A print ad for Al's March 24, 2004 concert in Akron, OH. 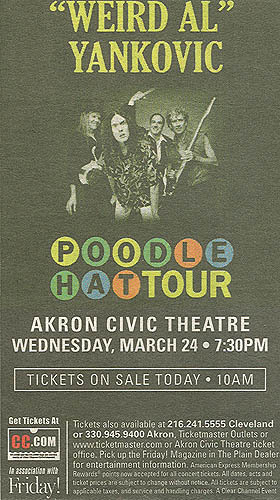 It was the first show on the 2004 leg of the Poodle Hat Tour. At one point early on Al said, "Well, this is our first show back," prompting massive applause throughout the crowd, as it was also Al's first performance in Akron in four years. The majority of the audience took Al's comment to mean it was his first time back in Akron, but he was actually referring to being back on the road in general.